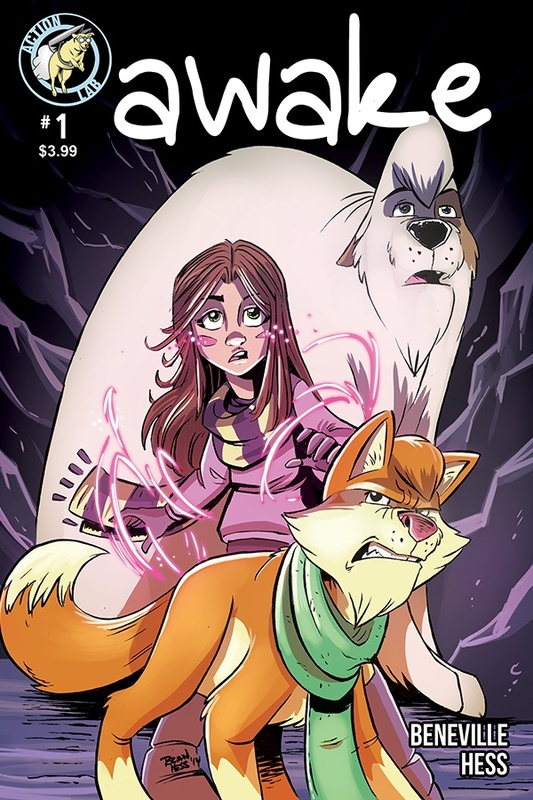 The Fellowship was fortunate enough to obtain a copy of AWAKE #1 from Action Lab Comics. Susan Beneville writes, and Brian Hess draws and colors. Regn bears a great responsibility. She is tasked with waking the planet. She must journey far to a cave, where she will face her fears and channel powers she can barely control in order to awaken the spirit of her world to heal it. She fears because she is young, and because her older brother tried and failed. But she reaches her goal, only to learn that something else is going on. This is a story with tons of potential. This issue starts out with a very narrow focus on Regn and her “animal” friends, which leaves room for some mystery as to the scope of the story. We do get a bit of intro to a couple of other characters, but again, we’re left with plenty of mystery about them. The art does a nice job of adding to Regn’s nervousness, in that the whole world seems to be against her (with the weather and the animal attack). It blends the realistic with the fantastic very smoothly. Regn’s quest is just beginning, even though she thought she was nearly finished (I hope that’s not a spoiler). I like where this quest is going, so check it out. AWAKE #1 is available now at your FLCS or at actionlabcomics.com.